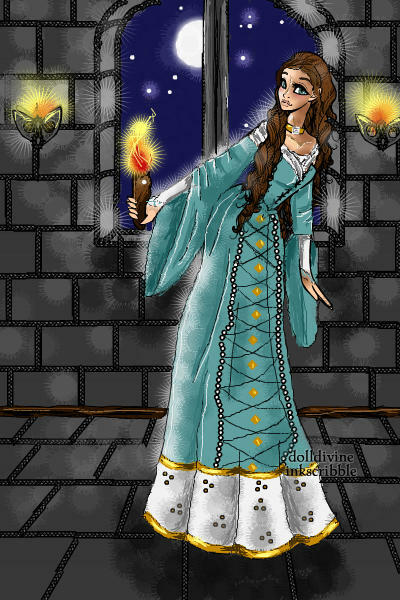 "...And the light that shines through the window will show you the way"
The dress is gorgeous, and I love the wall sconces and torch! Then there's the shadows on the floor and wall, wow! Incredible! The only issue is with the hand holding the torch, it looks a little off. I think the thumb should've been raised a little. Other than that, it's simply stunning!I love the shadowing. Congratulations! You won the award for prettiest in my contest "The best of the best"! This category was the most difficult because there were far more competitors than all the others! Nevertheless your creation crushed the competition! The dress you've created for this beauty is so realistic that I can almost hear the rustling on the stones of the floor in the night! But the real strength of this doll is the spectacular work of light and shadow that you created in the background! Compliments! This is stunning!! I love all the details and the shading. Wow! It's perfect! OMG! This is soooooooooooooo amazing. Everything about it is perfection. Love it. This is tooooo amaaazing, you are so talented!